Occupies alpine and subalpine habitats, with burrows in rock outcrops, boulder fields, or talus slopes adjacent to meadows. A diurnal herbivore that is fairly selective in the plants that it eats. In Montana, hoary marmots eat many flowering species, including silky lupine, Indian paintbrush, and glacier lily, as well as grasses and sedges (Foresman 2012). Highly social (Braun et al. 2011). Colonies are typically made up of one adult male, one or more adult females, yearlings, and young-of-the-year (Foresman 2012). At two years of age, offspring disperse from the natal colony. Colonies maintain separate burrows for hibernation, sleeping, and refuge from predators (Braun et al. 2011). Spends the majority of its life hibernating. 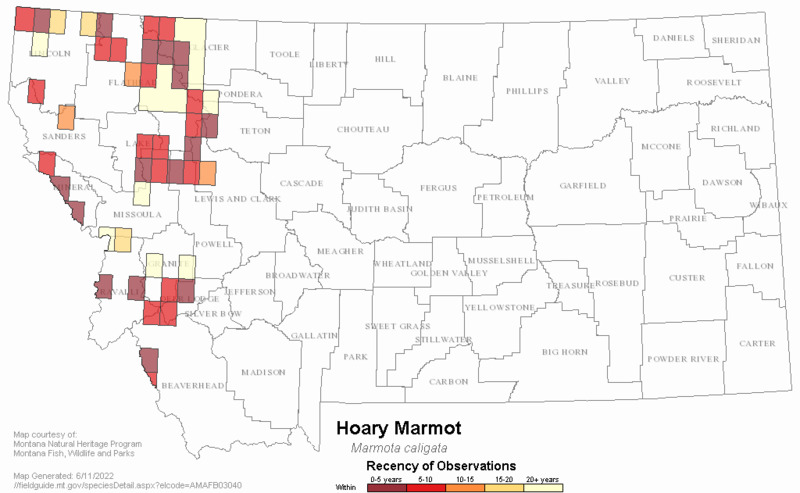 In Montana, hoary marmots hibernated from September to early May (Foresman 2012). May be able to outcompete Marmota flaviventris in high-elevation habitats (Hoffman 1974). Barash, D.P. 1973. Habitat utilization in three species of subalpine mammals. Journal of Mammalogy. 54(1): 247-250. Barash, D.P. 1974. The social behavior of the hoary marmot (Marmota caligata). Animal Behaviour. 22(1): 256-261. Dice, L.R. 1923. Mammal associations and habitats of the Flathead Lake Region, Montana. Ecology 4(3): 247-260. Tyser, R.W. 1980. Use of substrate for surveillance behaviors in a community of talus slope mammals. The American Midland Naturalist 104(1): 32-38. Tyser, Robin W. 1978. Foraging and substrate use patterns in talus slope mammals. PhD Dissertation. University of Wisconsin-Madison. 142pp. 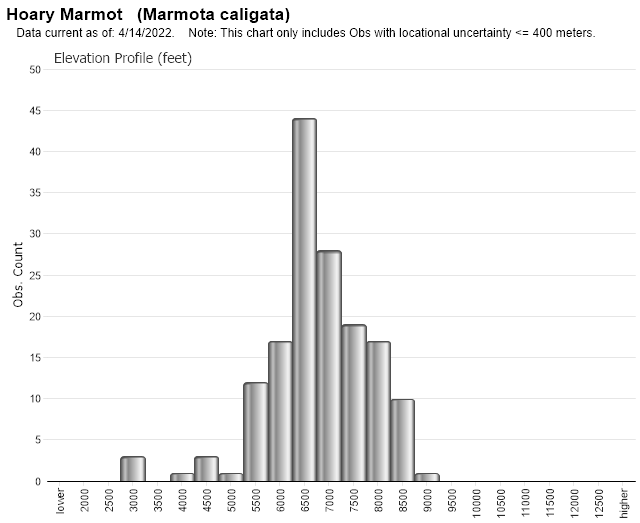 Web Search Engines for Articles on "Hoary Marmot"